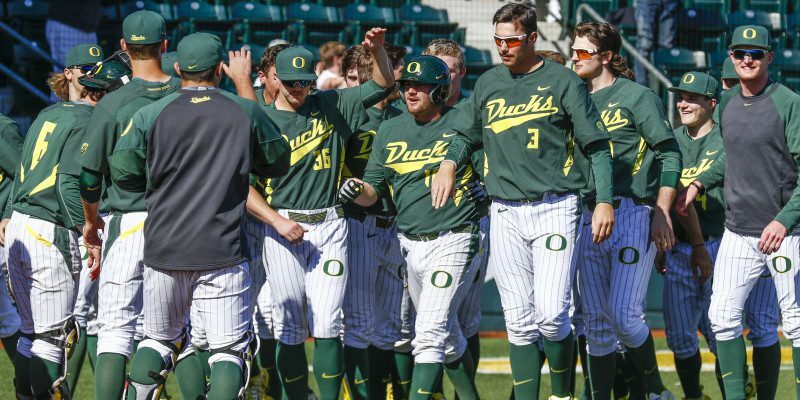 The Ducks (13-2) swept their series with St. John’s, outscoring them 8-6 Sunday. St. John’s took the early lead in the 2nd inning by putting up two runs. The Ducks followed shortly after, tying the game in the bottom of the 5th at two runs apiece. The teams were knotted again in the top of the 8th but Oregon’s catcher Shaun Chase broke the tie with a two-run home run to give the Ducks the 8-6 lead. Cleavinger delivers a pitch in Oregon’s 8-6 win. After Chase put the Ducks on top, junior lefthander Garrett Cleavinger made his way to the mound for the 77th time in his career, making program history. He had a successful close for the Ducks, fanning three out of the seven batters he faced while completing the two-inning close. 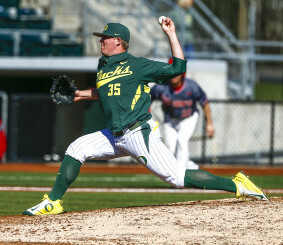 The Ducks’ starter, right hander Jack Karraker, finished the game with 6 innings pitched allowing six hits while striking out five St. John’s batters. Chase lead the Ducks by going 3-4 including the two RBIs from his homer. The Ducks look to continue their successful home stand against San Francisco on Tuesday. Oregon hopes to continue their success on the season in order to keep pace with the 15-1 USC Trojans in the non-league portion of the Pac-12 standings. After their midweek series against the Dons in Eugene, the Ducks will travel to Berkeley to start a three-game series with the 12-3 Cal Bears to open Pac-12 play.